Have you ever struggled with a traditional umbrella at the beach? Do you ever catch yourself wishing you had something that could stay in place even when the wind picks up? Did you know it’s possible to buy wind proof beach umbrellas for just this purpose? If you are looking for the best way to enjoy your time at the beach without having to worry about your umbrella flying off into the first breeze that comes your way, look no further than this article! Below, we’ve reviewed five of the best windproof umbrellas for you to compare. 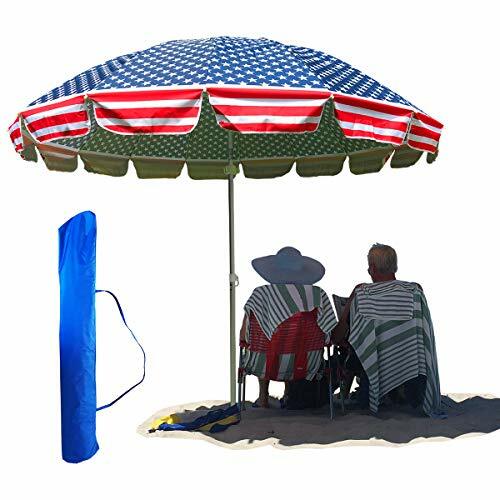 You’ll be able to find a great product that will keep you shaded and comfortable the next time you go to the beach. But just what makes these products windproof, anyway? Are they made out of some special material that prevents the wind from picking them up? Actually, they feature a swiveling or pivot design that allows them to move with the wind, therefore reducing the wind’s impact on the umbrella itself. With one of these umbrellas, you’ll never again have to worry about losing your shade to the first gust you experience. So let’s go shopping! Kick back and relax under the Yatio 7ft Beach Umbrella. This sturdy umbrella has a steel frame and an extra-long anchor to keep it in place better than most. It ones with its own carrying bag and has a UPF 100+ rating. This is a great umbrella that will last over several summers for most customers. The umbrella can be secured into the ground in just a few short minutes with or without help from another adult. Rarely, this umbrella may arrive damaged during shipping or storage. The colors in the umbrella may fade with extended use. 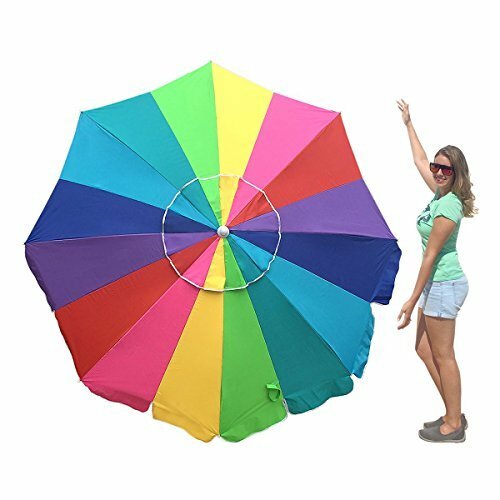 Choose between two different sizes with the EasyGo Rainbow Beach Umbrella. This fun and funky umbrella is lightweight and designed to be waterproof and rust-proof for long-term use. 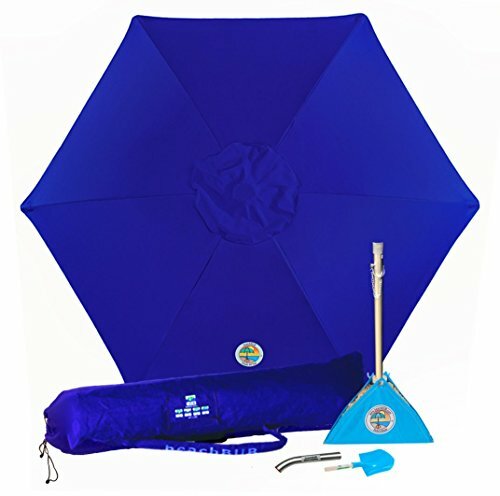 With plenty of UV protection, you’ll be safe from the harmful rays of the sun no matter how long you plan to sit out on the beach with this great umbrella. The umbrella can be popped up and screwed into the sand easily without help. This umbrella features an easy-to-use tilting function. The product may arrive broken in rare instances. The colors may fade over time with extended use. Choose the Party With Pride Giant 8’ Beach Umbrella for plenty of space for a couple of adults to enjoy the shade together. This umbrella includes built-in air vents to prevent it from being blown over too easily, and it also has a sturdy aluminum pole that holds up well to exposure to stronger winds. Use it on the patio or by the pool when you don’t have a beach trip planned! The umbrella doesn’t retain water much at all. This umbrella can be popped up in just a couple of minutes. This umbrella does not have an adjustable height option, so you’ll need to just bury it further in the sand if you want it shorter. The included carrying bag may become easily damaged after just a couple of uses. With the AosKe Portable Sun Shade Umbrella, you’ll enjoy all the comfort of a shady beach experience with none of the hassle. 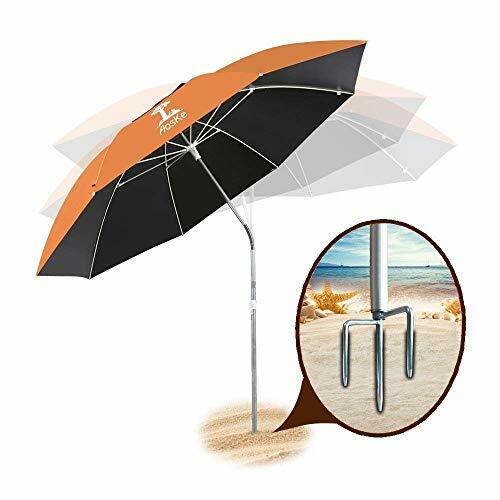 This umbrella features an aluminum pole for a lightweight and easy-to-use frame, and it sits in the sand with a pronged base that helps hold it in place more securely than a traditional umbrella. Best of all, it tilts as needed to protect you from the sun and to keep the wind from taking it away, too. This umbrella has an adjustable height that can be operated with one hand. The umbrella is large enough for a couple of adults to share the shade with no trouble. In very high winds, the pronged base may break in rare situations, especially if it isn’t secured deeply enough into the ground. This is a shorter beach umbrella than some of the others listed here and may not be tall enough for all customers. If you’re looking for the highest-quality and most popular windproof beach umbrella on the market, you need the BeachBub All-In-One Beach Umbrella System right away. This umbrella has been tested for use with winds up to 35mph and can be used on top of the sand without any need to dig a hole or bury part of the stand. Use it like a traditional patio umbrella and enjoy your day at the beach without breaking a sweat! The umbrella is thick, sturdy, and can be set up in just a couple of minutes. 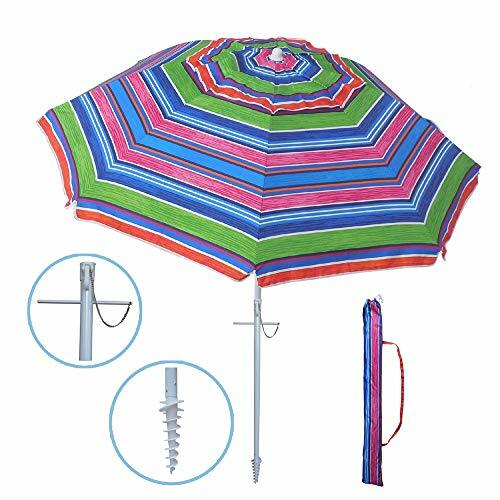 The material on top of the umbrella is UV-resistant and very durable. This umbrella may be over-budget for some buyers. This umbrella may be heavier to carry than some of the others listed here. Now that you’ve had a chance to check out some of these windproof umbrellas, you may be ready to pick one up right away. But if you’re still not sold, remember what a hassle it is to deal with the type of umbrella that isn’t windproof. Think about how hard it is to keep one of these umbrellas upright when the wind picks up, and remember all the times you’ve had to chase your umbrella down the beach when all you wanted to do was relax. These are some pretty compelling reasons to pick up a windproof umbrella! If you’re ready to make your beach experience easier and more comfortable than ever before, pick your favorite from the list of umbrellas above and bring home one or more of these great, high-quality products. You can’t go wrong with any of these umbrellas, so it all comes down to which one suits your needs and your tastes the best. Remember to clean and store your umbrella properly, too, so you’ll be able to use it for many summers to come. Rinse off your umbrella with your garden hose when you get home, let it air dry, and then store it somewhere away from direct sunlight until it’s time to use it again. Be sure you store it in any packaging it may have come with for best results. With the right maintenance routine, you’ll have your windproof umbrella with you for a long time to come!